We have many different financing options available to meet a variety of needs. Give us a call at (305) 596-5744 to learn about which financing programs might benefit you best. The application process usually can be completed in about 5 minutes. 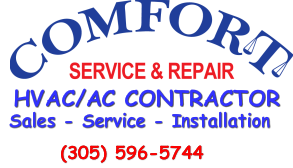 This is also a great time to have a COMFORT SERVICE AND REPAIR, Comfort Adviser perform a FREE HOME ENERGY EVALUATION. You may be wasting a lot of money each month due to an inefficient system. 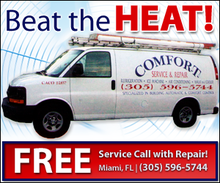 Give us a call at (305) 596-5744 to schedule a time for your FREE HOME ENERGY EVALUATION. We will provide you with all the details regarding system benefits, reduced cost, utility savings and your projected return on investment figures. The call and Energy Evaluation are FREE, but the comfort and savings are yours to keep. IS YOUR UNIT OVER 5 YEARS OLD? If so, NOW IS THE TIME TO HAVE IT REPLACED! YOU COULD ONLY SAVE!